As the competition between Instagram and Snapchat continues to heat up, a new blog post by Instagram today has revealed that the company's Snapchat clone "Instagram Stories" now has more daily active users than Snapchat itself. Of its 600 million users, Instagram now has more than 200 million users posting to or interacting with Stories every day, while Snapchat reportedly has around 158 million people using the original ephemeral social networking app, as of the last count. Snapchat's numbers don't specifically tie into use of its own "Stories," and include any interaction with the app, from text messaging to video calls. That last Snapchat update centered on data related to the fourth quarter of 2016, so it's likely those numbers are higher, but the growth of Instagram Stories in less than a year is quite noticeable. 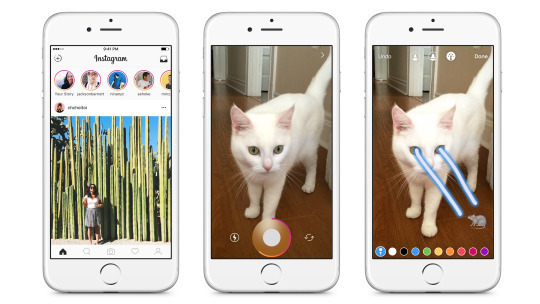 Facebook's copying of Snapchat in Instagram has gone far better than the same plan that the company recently enacted within Facebook itself, called Facebook Stories. Following a weak launch, the company updated its iOS app to make it look as if people were posting to Facebook Stories, when in fact they weren't. In more general update news, users on Instagram Stories can now create "Selfie Stickers" to post on their Story, which can also be pinned to specific places within videos. Today's app update also makes it easier to get to your favorite stickers, includes simplified video controls, and comes with new geostickers for Chicago, London, Madrid and Tokyo. Facebook Stories needs to be shown the door. If people want that functionality, they can use Instagram. At least give people the option to hide the "Stories" from the top of the newsfeed. It's obnoxious. The user interface for snapchat is terrible. It's as if their designers decided to completely ignore Apple's HIG. You need to be under 21 to understand how to navigate Snapchat. This app makes me feel old. I LOVE Snapchat, and I still am bitter towards Instagram (Facebook) for their blatant copying of Snapchat. BUT -- I use Instagram Stories often, both posting myself as well as watching others'. And I have to say that I'm not surprised that IG has more daily users than Snapchat. It's so much easier to connect with your audience when you can share stories from your life on the same platform that your portfolio is on (I'm talking about popular photographers in this case). It's much more difficult trying to convince your followers to leave Instagram, open Snapchat, add you by username, and then keep up with your stories from there. Stories works well in Instagram, but it's completely out of place in Facebook.